The healthcare industry is poised for a transformation in patient care. As healthcare organizations around the world strive to deliver new treatments and meet expectations for higher-quality care, reduced costs and better outcomes, they face a critical shortage of resources and an increasing incidence of chronic disease, which costs the US economy more than USD1 trillion annually. 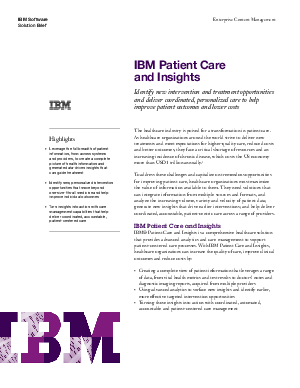 IBM Patient Care helps turn insights into actions with care management capabilities that help deliver coordinated, accountable, patient-centered care. Read on to learn how IBM Patient Care can help.